In single-pass inkjet digital printers, DROLED UV LED lamps are used for two main purposes during the printing process. Firstly to gel UV ink just deposited by the printheads on the support, in order to maintain the printing quality. The microdrops just poured on the printing support are immobilized and, because of the surface tensions of the material, movements or widenings of ink drops are avoided. Through Rod lens optics, it is possible to insert the UV LED lamps among the various colour bars, gelling each colour singularly. 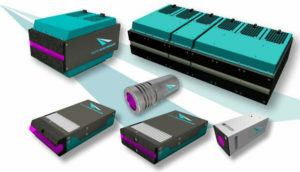 Also at the end of the printing process, high performance models of DROLED UV LED lamps with peak of irradiance up to 16W/cm², allow a complete UV Curing, with the polymerization in depth of the UV ink in a single trail.